A link to a video of Alex Goecke and myself talk about our Ofrenda to Robin Williams on display at the Detroit Institute of Arts. This video covers the artist talk at the Detroit Institute of Arts, where 28 artists talk about their ofrendas. Alex Goecke and Steve Miller are shown toward the end talking about their Ofrenda to Robin Williams. ROYAL OAK — Every day, Alex Goecke and Steve Miller maneuver through the routine of taking their kids to Northwood Elementary School, but the partnership forged at morning drop-off formed an artistic bond. Their common interests became apparent. Both men play guitar, have two children at Northwood and have a passion for the arts. When Goecke heard about an open exhibition invitation at the Detroit Institute of Arts, their bond solidified with success. 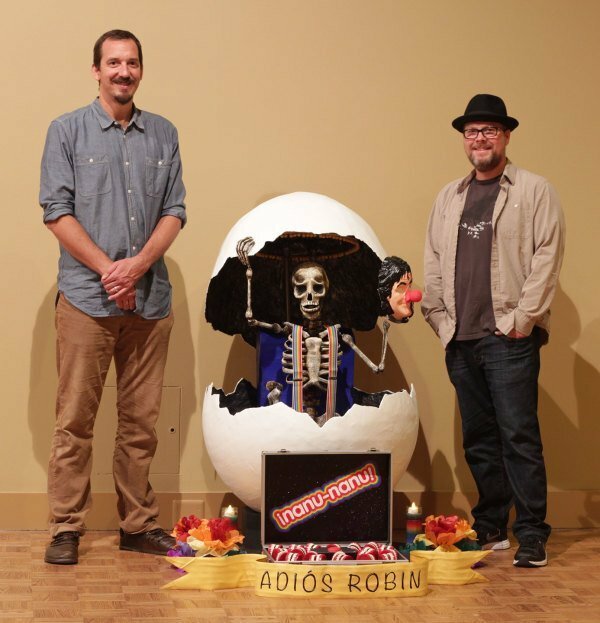 The Royal Oak dads were a part of 29 artists chosen to contribute an ofrenda to the DIA Mexican Dias de los Muertos exhibition Oct. 24-Nov. 2 at the Detroit museum. “Mexican folk art is a huge influence in my work,” Goecke said. He studied artwork in Mexico and covers the subject each fall as a middle school art teacher in the Dearborn Public Schools. His forte is sculpture, while Steve’s background is in painting and graphic design. There were no restrictions on the medium, per the contest guidelines, and both men said that agreeing on an idea for their submission was simple. Their interactive, sculptural installation based on paper mache and found objects was the artists’ homage to the late actor and comedian, Robin Williams. “He is a huge loss to the celebrity world, and the fact that he took his own life was interesting to us. The fact that he battled substance abuse was interesting to us. The fact that he reached out to people even when he was kind of hurting a lot — reached out to help others continuously,” Miller said. “We loved both his comedic roles and his serious roles, and like Steve said, he was just a man who was just so gifted. But you could tell he was touched by greatness, but also this bitter despair, and I think that magic kind of shows up in his work, kind of teeters on the edge, and I think that is something artists are interested in,” Goecke said. It took about a week to generate the digitally sketched proposal to send to the DIA for consideration. Steve’s background in graphic design helped the artists complete the detailed five-page submission. Once the men received word that they were chosen for inclusion in the exhibition, they went into artist mode. Both men said they never would have been able to disappear for two weeks if it wasn’t for the support of their wives and other family members who pitched in with the kids and everything else the men usually do on a weekly basis. The duo would work from about 4-10 p.m. every weeknight, and they spent both weekend days in the art studio/jam room/man cave. It was about three months of work crammed into two weeks, Miller said. They finished the sculpture Oct. 19, delivered it Oct. 21, and attended an opening ceremony Oct. 24. The materials they used to complete their installation were almost as intriguing as the final piece. CPAP tube is the skeletal spine, and an old BMX wheel supports an egg structure. “When you are an artist, you look at things that are around you, and you look at them differently, and you see how you can repurpose them, and that is really how we solved most of these problems – repurposing found objects,” Miler said. Although the egg structure was the most challenging, they are most proud of creating the skeleton. “It kind of rides the line between Day of the Dead, folky, anatomically correct realism, and sort of dramatic lighting, which is done by color, not real light,” Miller said. 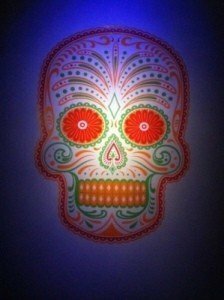 Both artists were cognizant of creating something true to themselves while honoring the Day of the Dead tradition. “It is not easy to pull off both a dark and light subject matter together in the same space in a light-hearted-yet-serious way,” Miller said. Traditionally, an ofrenda is an offering, so it is an invitation for the souls to come back and visit during the Days of the Dead. Goecke explained that more traditionally you’d see people putting out food, or Coke bottles, or cigarettes, or something. The piece also included a button that museumgoers could push to activate a laugh track. “It is an offering to Robin Williams. Thanks for the laughs; come back and grace us with a joke,” Miller said. Each component of the sculpture carries significance to the artists. “He was introduced to the American public that way, and we thought we would send him off in that same fashion,” Miller said.